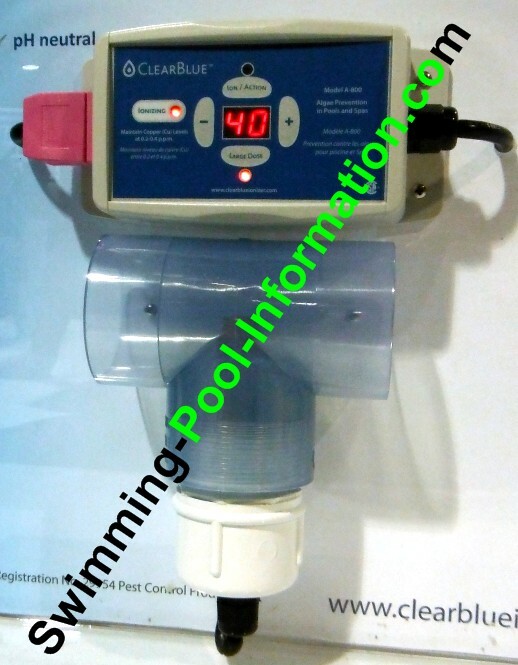 A common question I get all the time is: "do you recommend a chlorine free pool system such as a copper ion system like Ecosmarte or a salt chlorine generator? 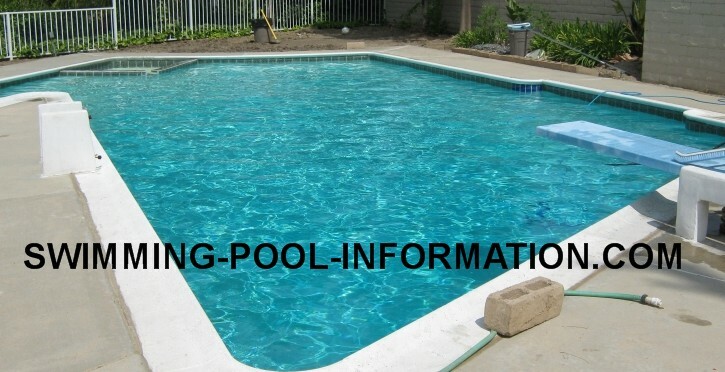 "....well it depends...it it was my personal pool,I would like an ion system in conjunction with UV/Ozone ,but a chlorine free pool requires more diligent attention to water parameters such as PH,phosphates,salt levels and more brushing and filter cleaning than a pool loaded with chlorine but the water is healthier and more like bottled water. 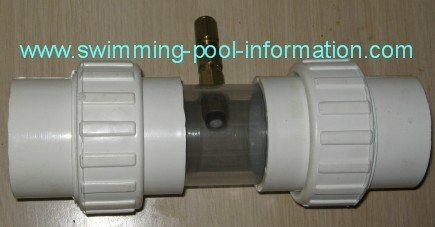 But if you have no time or desire to deal with these issues a salt chlorine generator is an easier option...also I believe UV/Ozone gives you more bang for the buck over copper ion systems. The unit above has two components in the clear chamber where the water goes through: a set of titanium plates and a set of thicker copper plates. The titanium plates run whenever the pump is running to produce oxygen to oxydize contaminants in water. 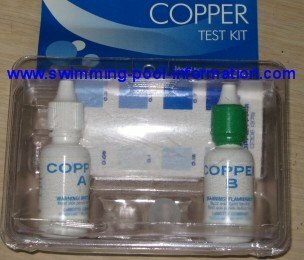 The copper plates are energized when the copper ion level in pool needs to be raised. The copper acts as a residual to help keep water algae free. These units come with copper test kit shown to make sure a minimum residual of copper is kept. Also,another benefit of this system is the electrolysis helps to eliminate calcium scale. 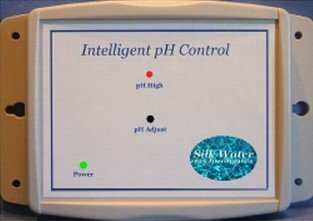 Another option available is PH balancing using CO2,or carbon dioxide. CO2 can only lower the PH to a certain level so there is no danger of damaging the pool or swimmers by adding too much - also,another benefit to using CO2 is the elimination of muriatic acid so the water is like bottled water. 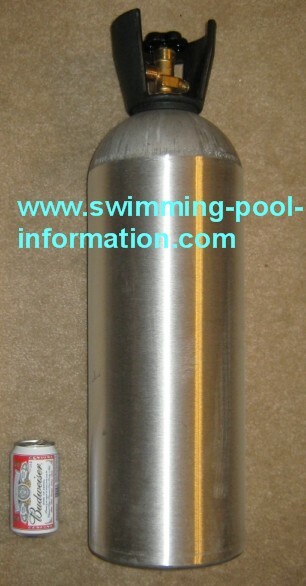 Shown below is CO2 tank,CO2 controller which attaches to tank,and the CO2 injection chamber. 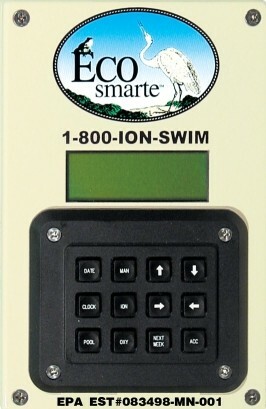 All Ecosmarte non chlorine pool systems carry a 5 year warranty and 60 day money back guarantee. 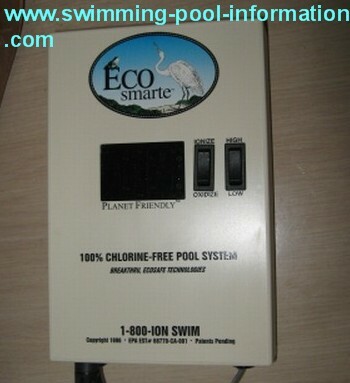 note: Ecosmarte originally came with a PH sensor but gave up on it after encountering too many problems and went with timed CO2 injection instead...possibly Silkwater has solved these issues. 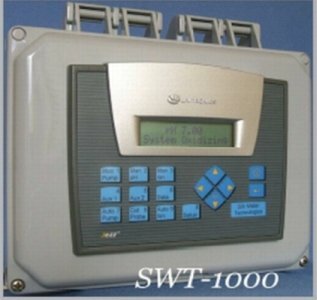 2)The SWT-1000 system can be wired with a relay to control the pool pump. 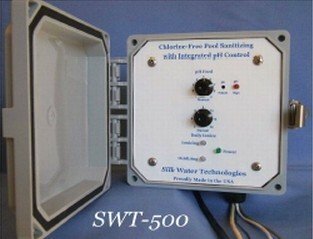 4)The SWT-500 units come with optional flow sensor to protect the oxy/ion chamber if water flow is inadequate...(July 2008 I have heard Ecosmarte offers this too) and a timed CO2 injection at a considerable discount from the programmable version. 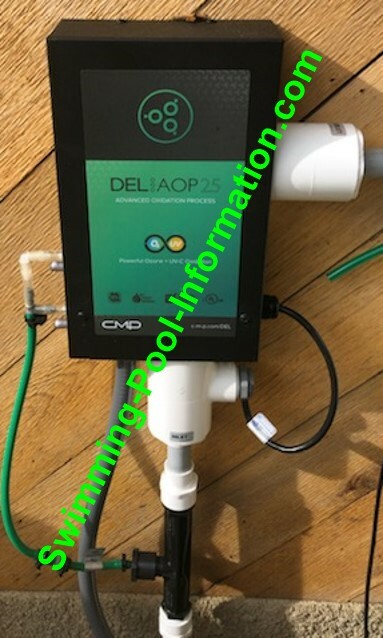 Down below is the Delzone AOP25 - water enters thru bottom and is exposed to UV bulb and also ozone is injected thru green hose...I have only installed two of these units but so far customers seem to like them. I would also suggest using 25% hydrogen peroxide as a shock rather than potassium monopersulphate-I believe its much better on the skin. A brand called Baquacil makes an oxidizer thats 27% hydrogen peroxide I believe its around 14 bucks a gallon. 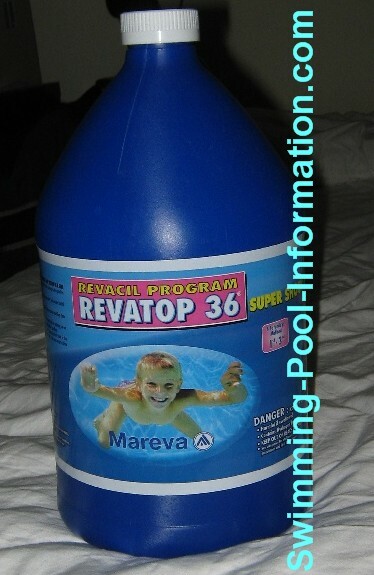 There is also a brand called Revatop 36 that is 34.55% hydrogen peroxide for about the same price. (Shown below) But if you run the Ecosmarte unit long enough in the oxygen mode,you may not need a separate oxidizer. Another thing about these units is they work better with a higher level of copper....however,the higher levels may stain white plaster with a blue marble like effect which I think looks attractive,makes the water look more blue,and the copper helps keep algae from growing on the pool walls. But if you are the type of person who wants his plaster bright white like a bathtub these systems are probably not for you. 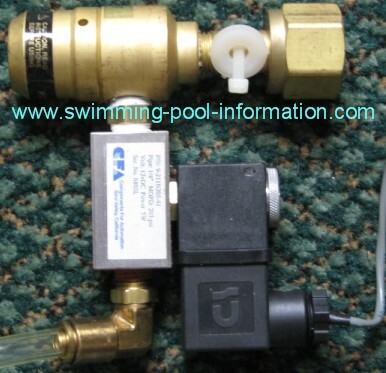 1)UV/Ozone gives you more bang for the buck than a copper ion systems (and UV/Ozone works well with chlorine salt systems) BUT copper ions give you a residual when equipment is off.